If you're like me and keep around a full quest log and don't clear it out every few days, you're going to want to login and get on that! A patch is scheduled for tomorrow, Feb 5, with card nerfs and lunar new year content so by clearing out your quest log you'll without issue gain any new quests they add to the game. We're not sure if they're going to be new daily quests, a dedicated one-time quest chain, or just a single quests; What we can tell you though is they will end up rewarding Arcane Dust and Gold! We'll also be getting a free golden Fireworks Tech for logging in. Woot! I think to be safe the best approach would be to only carry over 1 quest, that way you get the benefit of at least 2 quests if this way is correct, but if they are adding a continuous quest you could get that benefit as well. Will the pach hit at midnight in the individual time zone or will it launch simultaneously? but if its gold and dust and the old ones give dust and you only get one new? In other words: it's better to clear your quest log. 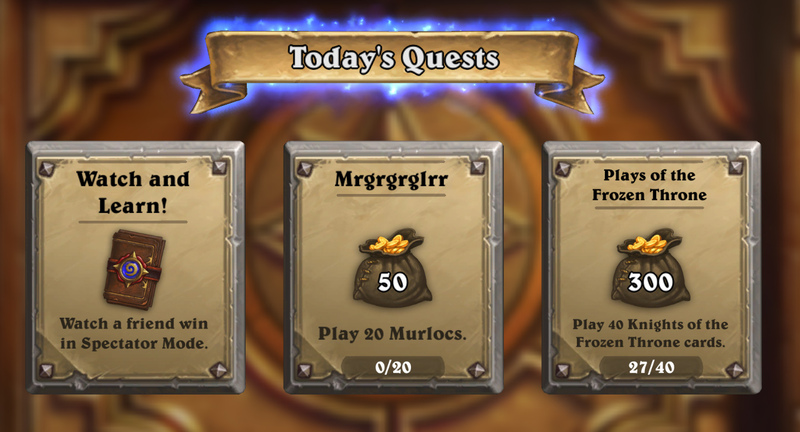 I was under the impression that quests would just give both Gold and Dust (like the Frost Festival?). You mean clear "all" 3 quests or just have 1 quest slot open as usual? Location: Somewhere in a mage tower. To me, clear out means get to zero in the log by day's end. I guess he means that if you are as lazy as he is, you want to clear all 3 slots. This way you can log in again after few days without losing "double value" quests. I'd clear them all just to be safe. You'll want at least 2 slots open though if they aren't daily quests since you'll get your normal daily tomorrow followed by another quest post-patch. Play it safe though, clear that log! I'll get on it later. I made sure to keep two 'dangling' quests just like Haussenfuss mentioned. However, I will trust your advice on this as everybody else seems to trust you. I hope your insider info is reliable.